John seriously considered leaving this recipe out of the book, not because there is anything wrong with it, but because he didn t really want us to have it. His generous good nature has won through, however, so here it is. While he would maintain that this is the best hedgerow delight imaginable, the elderflowers could easily be replaced with Japanese rose petals. A further possibility would be to use rosehip syrup to make Turkish delight, adjusting the sugar and water amounts accordingly. Soak the gelatine in a shallow dish of cold water to soften. Strip the elderflower blossom from the stems with a fork and tie them in a piece of muslin to form a bag, leaving a length of string. Put the granulated sugar, lemon juice and 300ml water in a heavy-based saucepan, heat gently until the sugar is dissolved, then leave to cool. In a bowl, mix 100g of the cornflour with the remaining 100ml water until smooth, then stir into the lemon sugar syrup. Return the saucepan to a low heat. Squeeze the gelatine to remove excess water, then add to the mixture and stir with a balloon whisk until the gelatine has dissolved. Bring the mixture very slowly to the boil and simmer for 10 minutes, stirring almost continuously to prevent the mixture sticking and any volcanic build-up of steam.Suspend the muslin bag of elderflowers in the mixture and simmer, still stirring, fora further 15 minutes, giving the muslin bag an occasional squeeze with the back ofthe spoon to release the elderflower fragrance. The mixture will gradually clarify andbecome extremely gloopy. When ready, leave to cool for 10 minutes. Mix the remaining 30g cornflour with the icing sugar. Line a shallow baking tin, about 20cm square, with baking parchment and dust with a heaped tablespoonful of the icing sugar and cornflour mixture. Remove the muslin bag from the gloopy mixture, then pour it into the baking tin and place in a cool place (but not the fridge) to set. Now refrigerate for a few hours until it becomes rubbery. 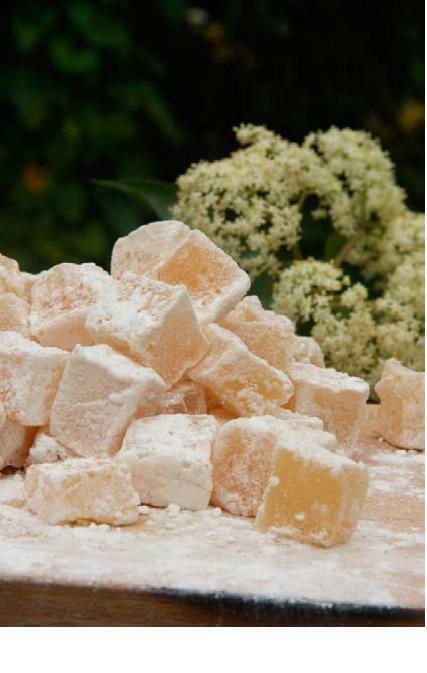 Cut the elderflower delight into cubes with a knife or scissors and dust with the remaining icing sugar and cornflour.